This type of surgery is performed to help improve nasal breathing, an issue that Jennifer Aniston apparently had. 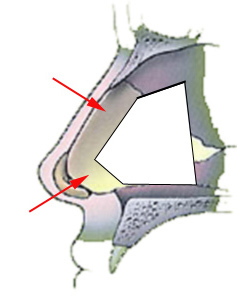 Septoplasty, unlike rhinoplasty or nosejob, does NOT change the outside appearance of the nose. All the work is done internally. (Watch video here). The explanation for why the nasal appearance does not change after septoplasty is actually quite simple. The analogy would be a house where the appearance on the outside would not change even though you may knock down a wall between two rooms inside the home. SO... Here is a side view of the septum. The blue arrow is pointing to the nostril opening and the red arrow is pointing to the lip. In this picture below, the septum has been removed. So that in a nutshell is the explanation for why deviated septum surgery does not change the outside nasal appearance. The way the deviated septum itself is removed can be more simply understood looking at the nose from a different vantage point. A small incision is made inside the nose and the mucosal lining carefully lifted away from the septum on one side. It is during this stage of the procedure that one of the complications of the procedure, septal perforation, may occur. 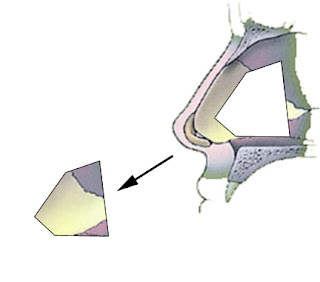 This complication occurs when the lining gets torn resulting in a hole as the mucosa is lifted away from the septum. The septum is incised immediately in front of the deviation and the nasal mucosal lining is lifted away from the septum on the opposite side. The deviated septum is now physically removed. One removes the deviated septum completely instead of forcing it into a midline position. Why? 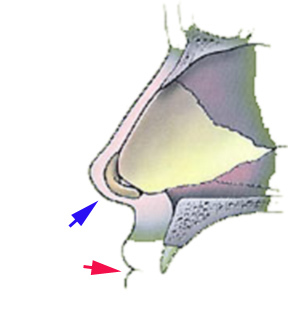 Because just like a young tree sapling, the nasal septum has "memory" and bending or forcing it into a certain position will last only temporarily before it springs back into its original position. The nasal mucosal lining is reapproximated in the midline. There are several methods how this last step is performed. One method is to suture the lining back together like a quilt (NO nasal packing or septal splints are used). Occasionally, the nose is packed with septal splints or nasal packing material. Both methods are used in our practice depending on the physician and the condition of the septum itself. Read more about the septoplasty surgery here or watch a video! It may be subtle but there's NO doubt she's had at least one standard nose job she may not have gone extreme but I don't see the point in trying to deny it when all one has to do is LOOK at photos of her.